The countdown continues with two very different indie-rock records — one whose appeal is strongly tied to lyrics, the other more well … um … sonic. 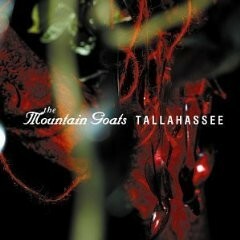 Songwriter John Darnielle has released some 16 albums under the Mountain Goats moniker since the mid-’90s, but Tallahassee was a breakthrough — a more polished record on a more prominent label than his hard-to-find and lo-fi earlier albums. It's also a songwriting tour de force, a concept album about a couple that makes a cross-country move only to watch their relationship disintegrate. It's set in the titular town, where plums grow heavy with nectar in the front yard, but in this paradise their love passes out on the couch and their house — no longer a home — drips blood. Tallahassee's mid-album peak, "No Children," is so intensely dark it's also intentionally comical. But the wordplay is dazzling throughout. Samples: "I am not going to lose you/We are going to stay married/In this house like a Louisiana graveyard/Where nothing stays buried." "Our love is like the border between Greece and Albania/Trucks loaded down with weapons/Crossing over every night/Moon yellow and bright." The most durable American rock band ever, Sonic Youth has been making music for nearly 25 years and with a career arc all their own — from free-formish noise to mainstreamish alt-rock to expansive urban-pastoral art jams. And as blasphemous as it may sound to longtime diehards, I'm not sure this outrageously tuneful little gem (studio full-length #14, if you're counting) isn't their best album. The prettiest, most bracing guitar album I've heard since 2002's Specialist in All Styles, by Senegalese comeback band Orchestra Baobob. There have been lots of great Beyonce singles this decade. This one edges out the underrated "Check On It" for being more exciting and more ubiquitous. Official video here.